Rapid transit connectivity to the university would alleviate traffic congestion and lessen commute time for the more than 80,000 transit trips to UBC daily. UBC’s subway dreams are finally being put in motion, but there’s nothing rapid about bringing the SkyTrain to campus. Vancouver City Council voted on January 30 to support extending the proposed Broadway subway to the Point Grey campus, the first concrete step to making the multi-billion dollar project a reality. The vote follows months of intensive advocacy from UBC, including a comprehensive communications strategy, an official website and social media marketing. According to UBC Associate VP Campus and Community Planning Michael White, the proposed SkyTrain extension will increase connectivity between the university and Metro Vancouver — a priority in the university’s Strategic Plan. The Translink report found that transportation along the Broadway Corridor is severely overcrowded, with more than 60,000 people a day on buses that run as often as every 2 to 3 minutes. When the SkyTrain Broadway extension reaches Arbutus in 2025, the report estimates that traffic on the B-Line from Arbutus to UBC be at maximum capacity during peak time. White said that UBC and city surveys have all found overwhelming support for extending the line. “From most of the consultation we’ve done on campus, through the development of the strategic plan, through the survey work that we’ve done and also from the feedback that the city and TransLink have had from their consultation efforts over the last year, year and a half, there does seem to be quite strong support for the extension of the line,” said White. 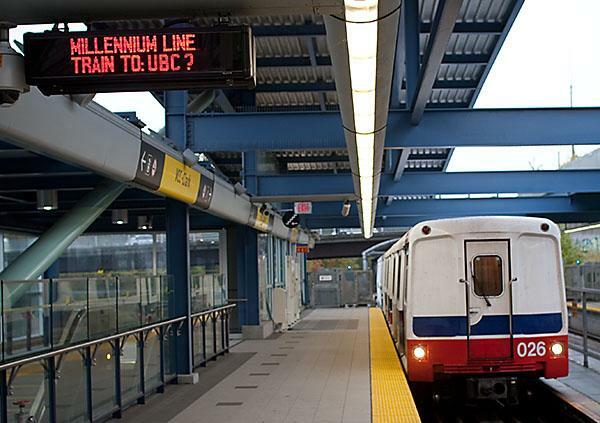 A report released by UBC on February 7, surveying 1000 residents, found that 82 percent of Metro Vancouver residents support extending the Millenium Line from Arbutus Street to campus. But despite insistence that there is wide support for the project, the university still has plenty of people to convince. Many residents east of Blanca oppose the subway’s expansion, asserting that the project’s high cost will not reap adequate benefits for Vancouver citizens. The Coalition of Vancouver Neighbourhoods (CVN), which represents the interests of several neighbourhood residents associations along the proposed Broadway subway, says it is firmly against the project. The CVN — whose membership includes the Kitsilano Residents Association and the West Point Grey Residents Association, among others — is lobbying the city to reconsider the subway’s expansion because of concerns about construction shutdowns on Broadway and decreased affordability of housing along the line. “The information that’s put out by the City of Vancouver’s transportation and transit departments is highly questionable,” said CVN Co-chair Larry Benge. The CVN claims the report shown to City Council are “ political documents masquerading as technical documents” and that tunnelling for the construction of the Broadway subway has not been included in the estimated cost of the project. The CVN also contends that the project will decrease availability of affordable housing along the line, as development of market housing along stops in Kitsilano and West Point Grey by private-public-partnerships and on endowment lands by UBC will promote high-end housing to cover the project’s costs. Benge also suggested that the affordable housing UBC touts as a result of the SkyTrain extension will likely be in further locales, such as Surrey. “This is all about development, it’s not about transit out to UBC,” said Benge. The CVN’s arguments are partially aligned with UBC professor and former mayoral candidate Patrick Condon, who has argued repeatedly that the school should prioritize on-campus housing rather than a subway. Condon’s argument that money for a subway could be invested in a wide light rail network has not been supported by Translink, nor have any of the CVN's claims. Now that City Council has voted to support the extension, the CVN plans to continue fighting the plan by writing letters and hopes to pursue more active strategies going forward. TransLink has asked the Mayors’ Council to support the $3 million Phase Two of the 10-Year Vision, which will evaluate SkyTrain concept designs for the project, and eventually result in the development of a business case. UBC will continue to build public support for the project in the hopes of securing investors. “We’ll be out in the community for years to come, ourselves, also trying to understand what the needs and interests are of the community in relation to the project itself.” said White.